Analysis of the previous NFL season’s data using advanced stats and metrics can reveal undervalued players in fantasy football. Oftentimes, fantasy owners fail to appreciate highly efficient players, because they failed to secure sufficient volume. In this search for efficiency studs, the advanced stats and metrics Production Premium and Target Premium can signal affordable wide receivers with upside. Production Premium isolates a player’s situation-agnostic efficiency and compares the outcome of all pass attempts, carries, and targets to league-average outcome in those same game situations (yard line, down, and distance). Target Premium , with origins linked to Rich Hribar, is the percentage of additional fantasy points per target that a wide receiver or tight end generates over and above the other pass receivers on his team. But, efficiency alone will not conceive a fantasy-relevant asset worth including in a portfolio. Opportunities must also be commanded. Target Share measures the percentage of all passing targets directed at a particular wide receiver or tight end in games that that receiver was involved in the passing attack. Tyreek Hill missed out on joining the group by just +1.6 Production Premium. Dreaming that these athletes will all perform similarly in 2019 would be foolish. Instead, wake up to the “touchdown variance” alarm going off. “Touchdown variance” can be taken into consideration with the advance metric, Expected Touchdown Differential, the difference between expected and actual touchdowns scored. All of the listed receivers had positive Expected Touchdown Differentials in 2018. But Lockett’s (+7.8) and Ridley’s (+6.4) indicate they more lucky than good and should leave fantasy owners incredulous. Instead, be deviant and acquire Wilson (+3.4), Higgins (+2.6), and Foster (+1.7) banking on them being talented, not fortuitous. Wilson balled out in college at Georgia State posting a 59.9-percent College Dominator (98th-percentile) and 16.6 college yards per reception (76th-percentile). He is 202-pounds with speedy wheels displayed by his 4.43-second 40-yard dash (86th-percentile). His prospect profile boasts two exciting Best Comparable Players: Santonio Holmes and Golden Tate–sorry, Bruce Ellington. Wilson was performing up to his advanced prospect profile in 2018 before his hip injury. He had a +60.6-percent Target Premium (No. 1) and a +28.2 Production Premium, which ranked No. 10 among receivers with at least 20 targets. Despite receiving just 35 targets (No. 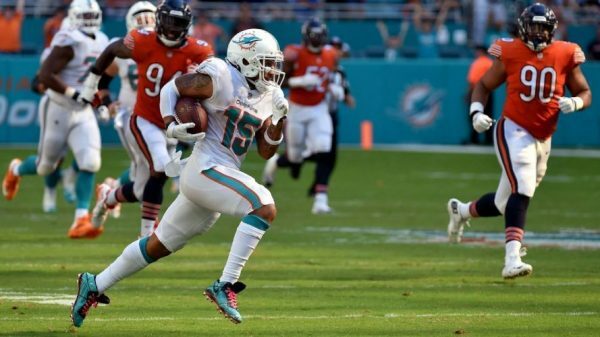 109) in seven games, Wilson displayed his alpha status in the Dolphins receiving core with a 14.6% Hog Rate (No. 26) and a 17.2-percent Target Share (No. 53). Wilson’s contract with $9,641,667 dead cap in 2019 ensures he’ll be in Miami at least one more year. His loss of Head Coach Adam Gase causes concern whether he can earn similar volume from new hire Robert Flores next year. However, Wilson is not yet 27 years old and demonstrated his skills in prior years with a 72.4-percent Contested Catch Rate (No. 4) and 111.9 Quarterback Rating When Targeted (No. 8) in 2017. Due to his injury, Wilson is undervalued in dynasty leagues given his ceiling and superb efficiency when on the field. Higgins was dominant at Colorado State at a young age evidenced by his 43.6-percent (88th-percentile) College Dominator and 18.9 (91st-percentile) Breakout Age. Those two specific advanced metrics can highlight talented wideouts, despite having underwhelming athleticism. Bengals’ 2018 third-year breakout receiver Tyler Boyd and Higgins have many similarities such as size (Boyd at 6-1, 197-pounds and Higgins at 6-1, 196-pounds), below-average workout metrics, and big-time college production (Boyd posted a 42.7-percent (86th-percentile) College Dominator and a 18.8 (92nd-percentile) Breakout Age). Higgins’s 2018 efficiency advanced metrics, +35.1 Production Premium (No. 1), +31.7-percent Target Premium (No. 10), and 92.6-percent True Catch Rate (No. 5), align with his mountains of stats accumulated in college. He is a 2019 Browns restricted free agent and developed rapport with Baker Mayfield to end the season with back-to-back games of double digit fantasy outputs. Efficient and only 24 years old, Cleveland, and fantasy owners, should get him on its roster in 2019, because Higgins appears to be prepped for a 3rd-year breakout like Boyd’s. Foster’s college profile is close to non-existent. He never broke out and has a 4.3-percent (1st percentile) College Dominator. But, he was the No. 23 overall ranked prospect in his class going into college, suffered injuries during school, and played at Alabama with tough competition for snaps and targets. Plus, his 4.41-second 40-yard dash (91st-percentile) and 105.1 Speed Score (83rd-percentile) add hope to his prospect profile. Foster’s speed and ability deep downfield were the keys to his +58.8-percent Target Premium (No. 2) and +31.5 Production Premium in 2018. Per efficiency advanced metrics, Foster has an argument that he was the league’s best deep threat in 2018. He posted 20.0 yards per reception (No.1) and 2.94 yard per pass route (No. 5). 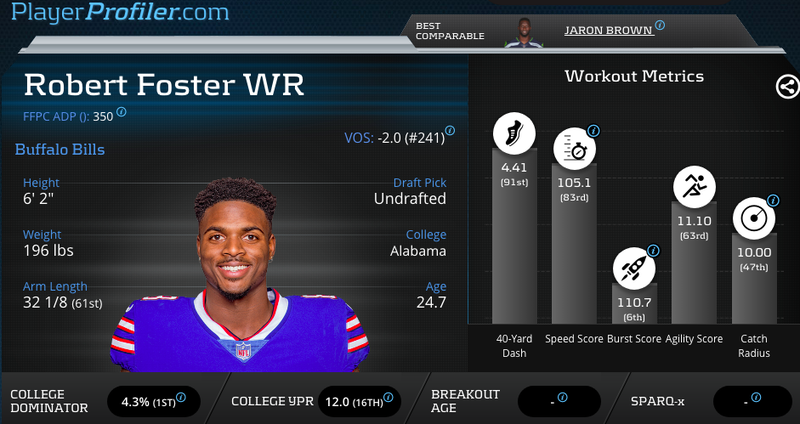 Foster also obviously has a robust connection with Josh Allen displayed by his 9.4 Target Quality Rating (No. 1) and 117.7 Quarterback Rating When Targeted (No. 12). Despite his meager college profile and failure to get drafted, Foster’s NFL success as a rookie is undeniable. Grab this speedy receiver this off-season, before he gets increased volume and truly breaks out, as the Bills’ No. 1 receiver.